Considering how expensive housing is in Japan, foreigners just off the boat tend to be surprised that there isn’t more communal living going on. Usually the only shared residences outside of company and student dormitories are those occupied by foreigners just off the boat, those little oases of non-Japanese manners and mores known as “gaijin houses.” Of course, most Japanese apartments, even the larger ones, are not really adequate for communal living the way apartments in the West are, and in any case Japanese landlords tend to frown on renting out properties to multiple persons if those persons are not married or otherwise related. Consequently, there’s no vocabulary for shared dwellings, much less a market. That is until now, and it appears to be a market-driven development. The explosion of vacant rental properties in the larger cities have prompted some real estate companies to take it upon themselves to offer what is being calle “share rooms,” meaning houses and apartment buildings with communal living rooms, kitchens and bathrooms. These companies rent out the bedrooms as they would apartments, and the practice has caught on so much so that the media is covering it as a fashionable trend. The internet is overflowing with share room bulletin boards. The main appeal is economic, but the real draw is social, especially among women who don’t feel safe living by themselves in one-room apartments in the city. Share rooms offer privacy with the option of interpersonal interaction. 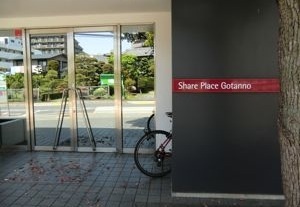 The model for this kind of living that’s been covered most by the media is Share Place Gotanno in Adachi Ward, Tokyo. Formerly a company dormitory (most share rooms are), the building has been reconverted by the Tokyo Electric-affiliated real estate company Rebita into 45 rooms centered around a living and dining area that is the equivalent in size to three households’ worth. Consequently, the kitchen has three large refrigerators. Each bedroom is the size of seven tatami mats and includes an air conditioner, a bed, a desk, and a storage unit. The monthly rent is from ¥58,000 to ¥62,000, there’s a “management fee” of ¥13,500, and a ¥50,000 deposit (30,000 refundable) is required. Foreigners are welcome. At present about 60 percent of the residents are women, and while many room share facilities are coed, there is one network called Tokyo Girls Fudosan that caters exclusively to females. They run several communal houses in the metropolitan area, some of which contain only three rooms. TGF has the added value of offering “theme rooms,” meaning designs and colors that match the mood of the potential tenant. The whole idea of their rentals is that communal living is fun. One share room situation profiled on NHK was about a group of young professionals who share a love of gardening getting together and renting a huge house in Kanagawa prefecture that had a large piece of land attached where they could grow flowers and food. Shared rentals in the West are much more makeshift: a bunch of friends takes an apartment together and splits the expenses, a practice that comes with its own dramatic uncertainties. In the Japanese style, share rooms have no uncertainties; no possibility of two roommates having to cover a third because he doesn’t have the rent or his share of the phone bill or utilities. Phone bills are basically non-existent at share rooms because everybody has a cell phone now, and as for utilities, including internet connections, most take care of it in the management fee. Many share house don’t take smokers, though some have isolated smoking areas. Of course, the real challenge of communal living is making friends and living in close proximity to people you didn’t know beforehand, and that seems to be as much of an attraction as anything. Why didn’t they think of this before? We have several Apartments and Guesthouses which are located in Tokyo and Ichikawa City, Chiba. Our mission is to offer living accommodations in a way not previously seen in Japan. Our goal is to provide a bridge between Japanese and foreigners for language and cultural exchange along with clean, comfortable, modern living at a reasonable price. For more information about our properties, please contact us at modernguesthouseliving@gmail.com or visit http://www.modernguesthouseliving.com.